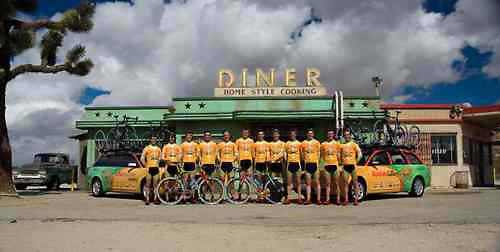 The Kodak Gallery Pro Cycling Team Presented by Sierra Nevada Brewing Co. has completed its winter 2007 training camp in California's high desert. The team trained for the week at elevation and was based out of Xantusia, a training facility operated by time-trial positioning guru Dan Empfield and tri-sports legend Mark Montgomery. Surrounded by snow capped peaks, riders soaked up the desert sun on rides varying from long stretches of wind blown flats to epic climbs through Angeles National Forest. Climbing specialist, Ben Raby appreciated the sometimes cold and blustery conditions, "I love the windy days - they toughen us up. This has been an excellent camp." Patrice Lemieux, President of team bike sponsor Kuota, traveled to the camp to work with Dan Empfield on refining the riders' aerodynamic positions on their new Kuota Kalibur time trial bikes. Several riders came away with dramatically improved positions, cutting a smaller hole through the wind while significantly increasing their power outputs. Michael Zellmann of SRAM also traveled to the camp. Zellmann spent time talking with riders and gathering feedback on SRAM's Force components. In reflecting on the training camp, team owner and General Manager, Robin Zellner said, "I was really impressed with how well our guys worked and road together this week. Our climbers showed excellent early season form and everyone is healthy. I am very pleased with what we've seen from our guys this week. I can't wait to get racing!" Canadian National Road Champion, Dominique Rollin added, "I was glad to see how many of our guys are riding at roughly the same level. We all got along very well and are looking forward to our first races together as a team. This time at altitude was very good for us." The team will be racing together for the first time this weekend at the NRC MERCO Grand Prix and Road Race in Merced, California. On Friday, several team riders will be making appearances at Merced area elementary schools to discuss bicycle safety with the students.